"Simple", "Easy", "Right" RTA software is soon to be released ! The C3 Acoustic Analyzer is a "RTA (Real Time Analyzer) with one-third octave band". You can do acoustic analysis of one-third-octave band by simply connecting MIC to PC. An appropriate tool for measurement and adjustment of audio reproduction environment. 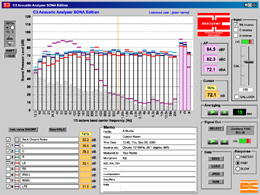 This tool has a simple user interface whose purpose is to measure audio reproduction characteristics. Usability is given top priority. People who do not get used to measuring can use it. # How you purchase the items is to be announced on this page. *Some sound cards may not work.